Home / Blog / Groove Cruise Miami 2020 Prices – Starting at $699/person! 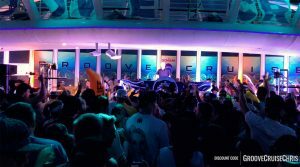 Here is what you need to know regarding the Groove Cruise Miami 2020 prices. 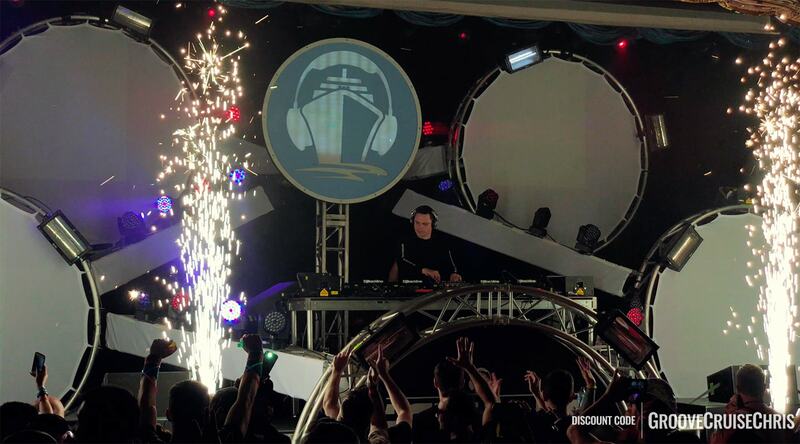 Cabins on this ship start at just $699/person (when you use my discount code). See the price grid below for all of the cabin options. Payment plans and more discounts are available, as well. 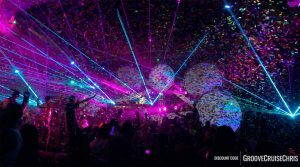 Groove Cruise Miami 2020 goes on sale to the public on February 6, 2019, at 2pm ET/11am PT. Remember that cabin availability with decrease and prices will increase as this floating festival approaches. For the absolute latest and most accurate pricing and cabin availability, refer to the booking engine. Price grid graphic as of 2/6/2019. The table below shows pricing as of the original public sale. Remember to refer to the booking engine for the most up-to-date cabin availability and prices. Cabin types will sell out and prices will go up as the festival nears. 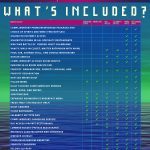 Refer to the Groove Cruise site for the most accurate availability and pricing, as well as official terms. Get $50 off/person: Red denotes the cabin price per person with my discount code, GrooveCruiseChris (How do I use this code?). Prices above include stateroom accommodations, meals, and most beverages. Alcohol and soda are not included. No matter what, you can use my discount code for an easy and instant $50 off/person. Plus, you can stack other available discounts (common ones are Female Foursome, Squad in a Quad, and Military Discounts) for even more savings. Details on additional discounts will be posted here once available. Payment plans are available for those who want to lock in their cabin choice and price now but pay over time. The amount of your down payment and remaining payments will depend on when you book and what type of cabin you book. Using a payment plan is easy. Just make a reservation like normal, then select the "Payment Plan" option while you're checking out. The options available to you and the complete terms and conditions will display here. 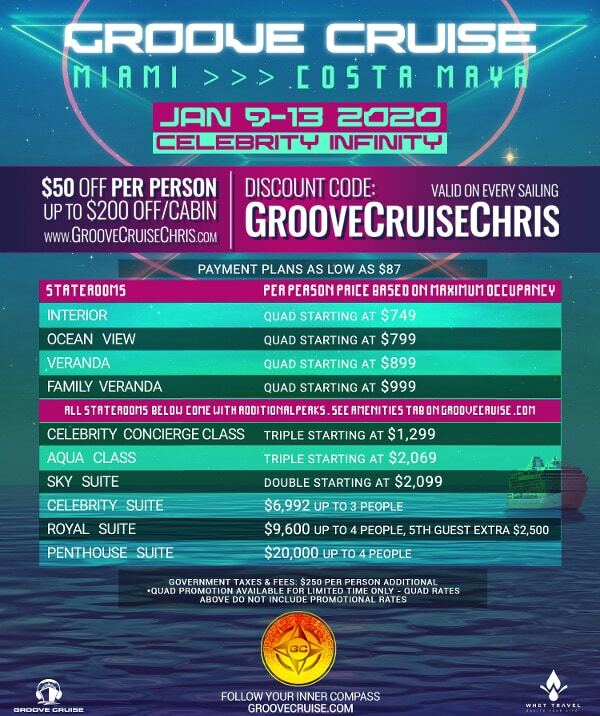 This is the perfect way to secure your cabin for Groove Cruise Miami 2020 without having to pay everything up front. There are no additional costs or fees for using a payment plan, AND you can still use my discount code along with any other available discounts (except for the "Pay-in-Full" promo, of course). This is the way to beat the price increases even if you want to pay over time. 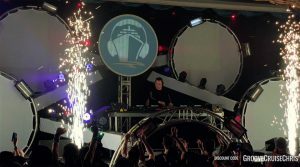 Make your Groove Cruise Miami 2020 booking now using the button below. The pricing table here is not real time, so refer to the booking engine for the latest pricing and availability. They are subject to change at any time without notice. Taxes and fees of $250/person are in addition to the cabin prices. The prices in the table above are based on occupancy - Double is 2 people, Triple is 3 people, and Quad is 4 people. 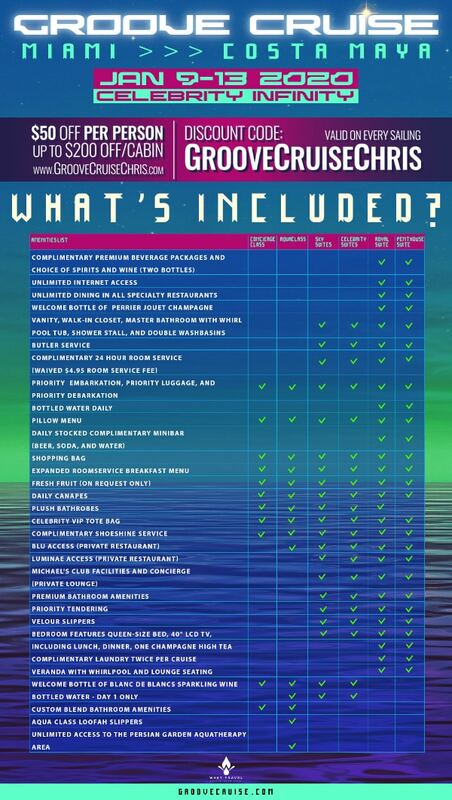 Also, Groove Cruise Miami 2020 prices are based on "double occupancy". What does this mean? It means that you want a stateroom all to yourself (known as "single occupancy"), it's possible, but the cost will be 200% of the double occupancy price. Just like any cruise, the cruise line charges passengers a mandatory and non-refundable service/gratuity fee to all guests. This small per day amount goes to the staff that works hard to keep your cabin made up, the dining areas clean, etc. This fee is not included above and will not be charged when you initially book your cabin. The service/gratuity fee gets added to your "onboard account" when you board the ship. These are subject to change without notice at Celebrity Cruise Lines’ discretion.